This article is part of an ongoing series honoring individuals who have made a difference in the world by applying a GIS solution to challenges or needs within conservation or their communities. Since these unique individuals have been selected for their innovations or special achievements in a particular field, the series is appropriately named GIS Heroes. 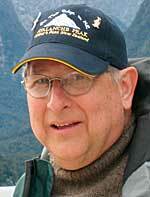 Esri recognizes Tom Tate as a GIS hero. Life-threatening hurricanes, invasive weeds, and damaging potholesno problem: ask the kids what to do. To Tom Tate, national program leader for the U.S. Department of Agriculture (USDA) Cooperative State Research Education and Extension Service (CSREES), this is the best answer, and for a good reason. His tireless efforts as the creative thinker and visionary behind educating the youth involved in the USDA's youth outreach program (4-H) has led to an onslaught of community problem solving headed by the youngest members of the communities. For years, Tate has recognized the integral role geospatial technologies should have in youth programs, which led him to encourage 4-H youth to expand their understanding of the world around them by using technology. His dedication helped create 4-H youth clubs across America in 500 counties in all 50 states and 2 U.S. territories, all of which engage in community mapping projects that solve a range of problems. In the mid-1970s, Tate discovered the power of the new GIS technology when he came across information from a federal government project that involved mapping population statistics to highlight growth trends. "I saw the technology as a new powerful way to visualize text, tables, columns of numbers, and other information. I thought, 'This would be great for both adults and kids, and we really need to expose them to it.'" At the time, Tate was working for the Cooperative Extension Service, a USDA outreach program, and knew that none of the 3,150 counties it worked with had ever seen their own data displayed in a graphic interface. Tate quickly realized that the power of new mapping technology, such as GIS, was the key to reaching communities and empowering them to solve any problems they encountered. Tate's quest to educate communities started with the youth. As personal computers spread across the nation and new technologies were readily embraced, Tate began with 4-H. "I knew if we got youth interested in visual representations of data, then the adults would also realize its value," he says. 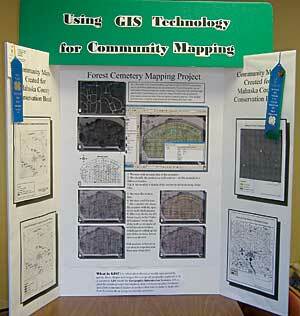 "I wanted to get GIS and technology into the hands of youth in order to have it better understood by adults." From the recommendations of the youth involved in 4-H groups, Tate and USDA created the 4-H Youth Technology Leadership Program, which put the power of organization and education in the hands of the youth themselves. The young members got computer labs established in their own schools, churches, and other community areas by gathering information and presenting it to Tate and the other leaders. By the late 1990s, Tate helped them establish more than 900 local computer labs and receive GIS education materials, including books and software. Here is an Iowa county fair exhibit with the National Geographic Society's Community Mapping Pioneer Award in the upper right-hand corner. This is an outstanding example of how 4-H can integrate the power of youth and geographic learning into community improvement. The computer labs and training materials were just the beginning for Tate. To get schools and communities interested in adopting new training and technology programs, Tate helped establish the National 4-H Youth Technology Leadership Conference in 2000. The conference introduced the concepts of GIS and GPS and conducted workshops that had the young attendees engage in real-world projects with results they could take back to their communities to show how they could help solve local problems. The conference had the youth develop a plan for implementing GIS and GPS so they could have an idea of how to overcome any barriers or constraints they might encounter. Tate explains, "Usually the way 4-H works is that there's somebody that volunteers, either a teacher, parent, or someone else, who comes to the conference as a chaperone and actually learns something about the technology too. They become a sort of intergenerational sales force when they go back home with an action plan for implementation." Since the initial conference, there have been many each year for different regions throughout the United States. Training groups consisting of youth who have used the technology for years often lead the training sessions. Once youth group members develop a project plan and begin to map community issues, USDA helps them gain expertise and exposure. At the local level, many peoplein spite of all the technology showcased on TV and the Internetare amazed when they see the maps by the youth customized to their own communities. Today, there are 50 state and county fairs that will exhibit 4-H youth community mapping projects to raise awareness about the power of the technology. As more communities learn about the technology from fairs, conferences, and other 4-H events, the more involved citizens becomeleading to more than 4,000 youth being introduced to the technology and conducting important projects. One example of a community mapping project is that youth mapped the potholes in their street as a starter project. They mapped the information and presented it to a group of adults who thought it was amazing that the kids identified a problem they were complaining about for years and showed where the action really needed to be taken. They then shared that information with the City Council to make a difference in the community's quality. The examples of community mapping projects are endless, each making a positive change. Tate was instrumental in writing, promoting, and receiving a grant from National Geographic to develop a 4-H program that will provide training to community partners and 4-H youth to create the Alert, Evacuate, and Shelter program in 11 southeastern U.S. coastal states. The program will be instrumental in supplying critical information to schools and communities at risk from hurricanes, tornadoes, floods, earthquakes, and wildfires. In 20072008, the Alert, Evacuate, and Shelter teams will assist 120 coastal counties in preparation for the impact of a hurricane. Partnerships between emergency management agencies, community leaders, and 4-H youth and adults will create networks whose goal will be to expand geographic literacy and incorporate strategies to keep residents safe. Tate meets with researchers to learn of their latest results that can be turned into a GIS project for the youth. Project ideas range from analyzing soil conditions and mapping ideal areas for growth to mapping agriculture that can produce fuel alternatives, such as soybeans, in biomass conversion. Enamored by the power of GIS to empower confident youth leaders as well as help communities, Tate has long been an inspiring champion of community mapping. "My role is really about building teams of trainers who are helping other people learn," Tate says. "My greatest sense of pride is that some of the youngsters who started with this program have themselves turned around and taught dozens of other youth how to use the tools and demonstrate the results to thousands of people at a variety of events. The supply of caring adults willing to donate a little bit of their spare time to work with a group of kids is our most valuable resource. We have about 600,000 adult volunteers across the country that are willing to give a few hours each month to help. All it takes is a few hours and they get so much back. It's what keeps us vital." If you would like to volunteer with 4-H community mapping programs or learn more about the projects, visit www.csrees.usda.gov/informationtechnologyeducation.cfm or contact Tom Tate (e-mail: TTATE@csrees.usda.gov).